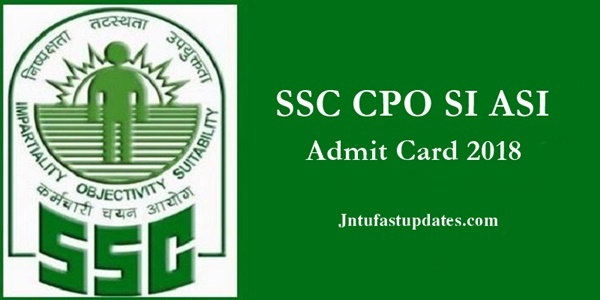 SSC CPO Tier 1 Admit Card 2018 : Staff Selection Commission (SSC) has recently announced the Central Police Organization (CPO) Sub-inspector (SI) and Assistant Sub-inspector (ASI) posts. Many Of the aspirants seeking to become the SI/ASI have applied for the SSC CPO posts 2018. The SSC is going to conduct the examination from 4th June to 10th June 2018. Aspirants who have applied for the SSC CPO posts can download the CPO SI/ASI Admit Card 2018 from the official website ssc.nic.in. Candidates appearing the examination must carry the admit cards without forgetting. If not, the applicants will not be sent to appear for the examination. The hall ticket and identity proof verification will be done by the examination officers. Hence all the aspirants are intimated to download the hall ticket before the exam date and carry it without fail to avoid the unnecessary tensions. Candidates are also advised to reach the examination center in time. Latecomers will not be allowed to appear for the test. So, aspirants have to alert while attending the examination and follow all the guidelines issued by SSC to appear the test perfectly. Staff Selection Commission (SSC) annually issues various jobs for aspirants seeking Government jobs. The SSC has issued the SSC CPO (Central Police Organization) Posts. The vacancies include Sub-Inspector of Police and Assistant Sub-Inspector of Police posts. SSC CPO posts include an overall 1223 vacancies. Many of the aspirants interested in SSC jobs have applied from 3rd March to 4th April 2018. Lakhs of aspirants have applied for the CPO posts this year. Candidates will be selected through Paper-I /Tier I, Physical Standard Test, Paper-II/ Tier II, and Document verification for merit list of candidates. Candidates clearing each phase will be sent to the next stage of selection process. Finally, candidates clearing all rounds will be finally get selected for the announced posts. The SSC is going to organize the CPO Tier 1/paper 1 examination from june across the Nation. Lakhs of aspirants are going to appear for the Tier 1 examination this year. All the applicants can download CPO Tier 1 admit card from the SSC website, ssc.nic.in before 10 days of the examination (tentatively). After downloading the SSC CPO SI/ASI tier 1 hall ticket 2018 candidates can check the details of examination venue, date and time of the examination and other details such as the name of the candidate, register number, date of birth, scanned photograph of the applicant, and other details. Once after downloading the hall ticket candidates can also check various instructions for the examination as well. Also, the candidates have to carry any of the valid identity proof like Aadhar card/voter card etc as a proof of identity to show in the verification time. Aspirants must carry both hall ticket and identity proof while going to the examination. On the main page of the portal ‘SSC CPO Admit Card 2018’ Link appears; click on it. After that provide the necessary details such as your Registration ID Number and DOB. Download and Save it safely for future usage.